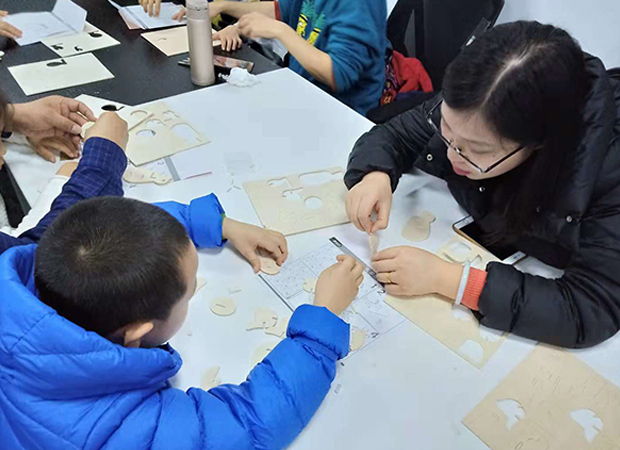 On December 2, 2018, Robud & Suzhou Experimental Primary School affiliated kindergarten organized a weekend parent-child activity. A total of 30 families participated in the event. They came to the headquarters of brand Robud early morning and looked forward to the upcoming wooden assembly game. 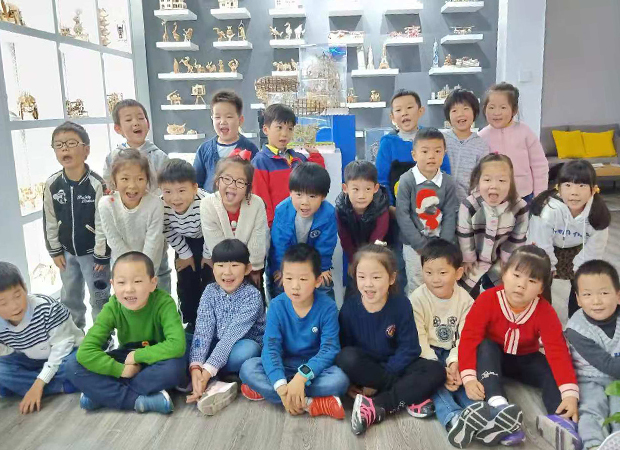 In order to let the children and parents learn more about our products, Robud’s staff first leads everyone to visit the sample room of the company. There are hundreds of products include all the sub brands (ROKR, ROBUD, ROLIFE, ROWOOD) are displayed. 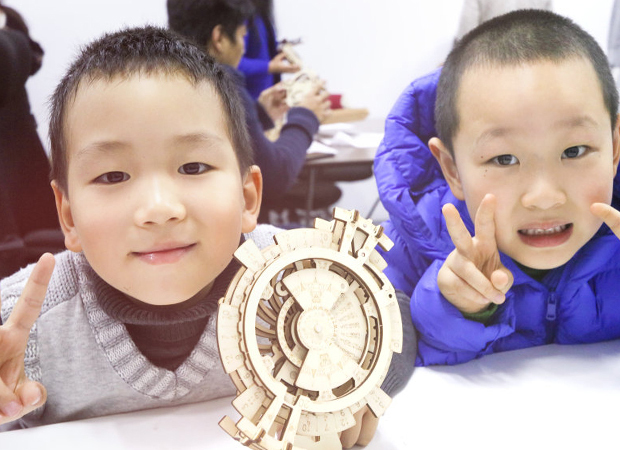 Parents are very interested in the craftsmanship and structural design of wooden toys, and the children are attracted by a variety of cute animal shapes, especially the new products of ROBUD. The clay dinosaur series, 6 life-like dinosaurs led the children to the Jurassic world. After the visit to the sample room, our assembly experience will officially begin! The first thing first play is the new products of the ROKR gear series – the perpetual calendar. This product is designed for players over 14 years old and is a bit too difficult for kindergarten kids! Fortunately, with the help of father and mother, each group of families was quickly assembled. The R&D staff also explained the movement principle of the gear to the children, and taught everyone how to adjust the date. Everyone is very fulfilled. Now, it’s ROBUD’s turn to play! Our game is to restore a cute rabbit. First we need to assemble the wooden parts into the skeleton of the rabbit, and then wrap the skeleton with clay to make up the muscles and skin of the rabbit. Look, are these rabbits look like real? Looking at the happy faces of all the cuties and the fruits of their labor, today is definitely a fulfilling day.